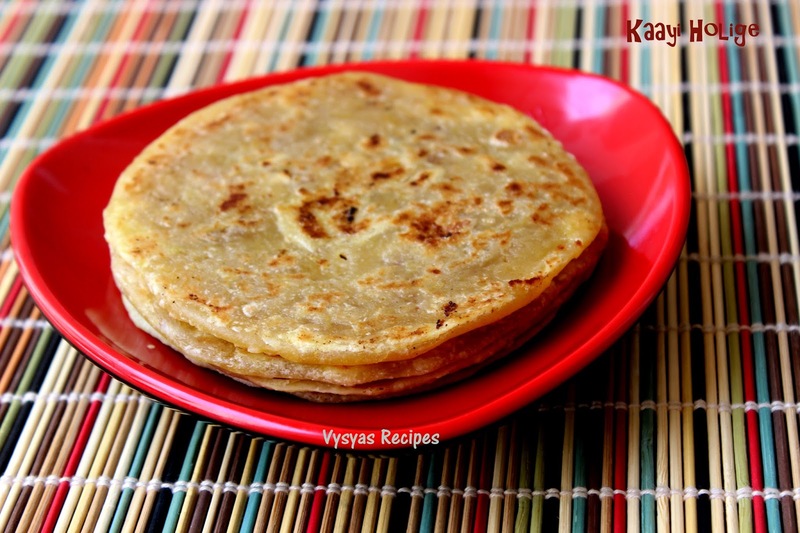 Kayi Holige is a classic Holige recipe made with sweet Coconut stuffing. 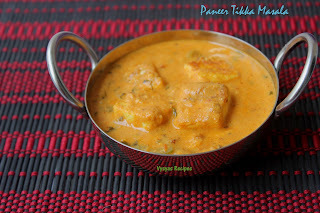 This recipe is made during festive occasions like Sankranthi, Ugadi,Navaratri &Diwali. Bread with freshly Grated Coconut & Jaggery Stuffing gives distinct taste. 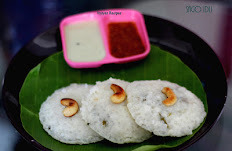 I am a Big fan of this Poli.In Adayar Anand Bhavan, they make soft & delicious Poli's. Whenever i Go to Adayar Anand Bhavan I order this Poli. Poli & Ugadi Goes hand to hand. As ugadi falls on April 08th, of this Month, I planned to post this popular boli Recipe. Turmeric Powder - A Generous Pinch. 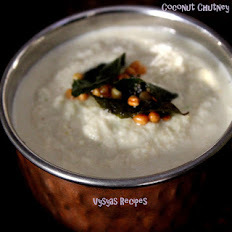 Coconut (Grated) - 2 cup. Combine Maida,salt, turmeric powder, 2 tbsp of oil together & add water little by little, to make a dough. finally add 1 tbsp of oil over the dough, cover it & let it sit aside for minimum 3 hours. Dough will loosen. Then after 3 hours, knead the dough again, to make smooth & pliable dough. 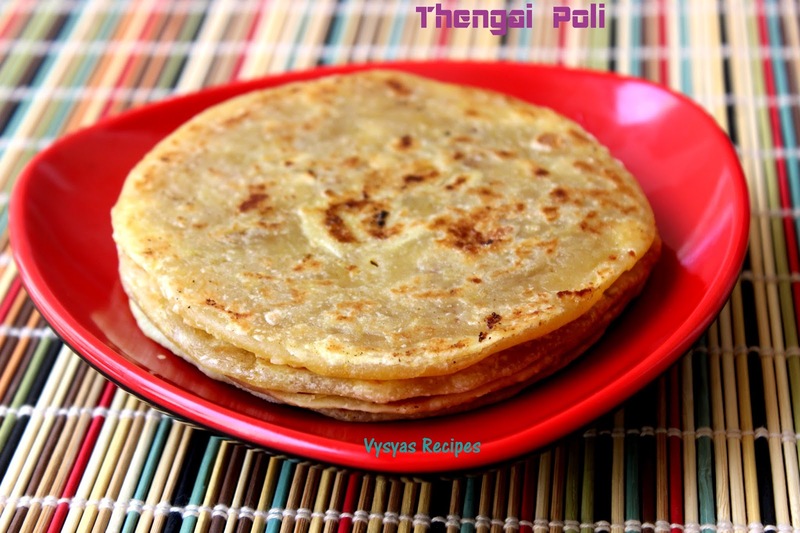 Grate the Coconut & Jaggery, & keep it Ready. Take a kadai, add a tsp of Ghee, add Grated coconut & Powdered Jaggery. Mix well.Cook in a Low flame,Jaggery melts & it gets incorporated with Coconut & becomes thick as shown in the Picture. It takes nearly 3 -4 minutes to combine.Finally add finely chopped Cashews & give a Quick Mix.Take a small quantity of filling & Roll it. you could able to make a ball. This will be the right consistency. Now Coconut Filling is Ready. Make equal sized balls from the dough, as shown in the picture. Grease the banana leaf or ziplock cover with oil, place the balls, and pat it into small poori's, as shown in the picture. Then place the filling - Purnam, at the centre, then bring the edges to gether. 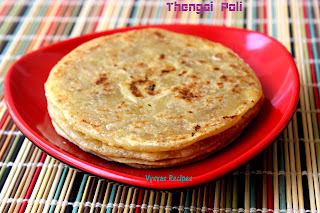 Again Grease your fingers with oil, then spread into thin Poli's.cook at low - medium flame, on both the sides, by drizzling a tsp of Ghee, till Golden spots appear.Repeat the Same Procedure for Remaining Dough. 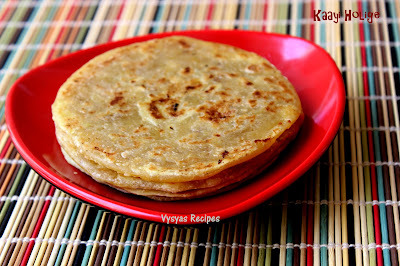 When it is cooked on both the sides, remove it from the tawa. More the time the dough sits aside, dough will be softer & becomes like elastic. Also, Do not compromise the quantity of oil, else dough won't be softer, so obviously poli's. 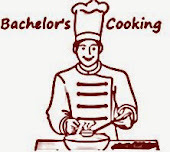 Making the dough thin or thick, depends upon your choice. Adding the turmeric is optional. Let the poornam be stiff, if watery, poornam will come out while making bobbatlu. you can add pinch of cardomom powder atlast while making the stuffing & give a quick Mix. 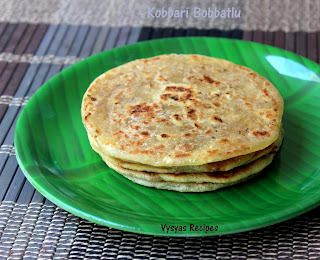 you can smear the Ghee on the top of Bobbatlu for extra taste. Coconut and cashew filling sounds amazing. This recipe is a keeper as a clever and different invention. 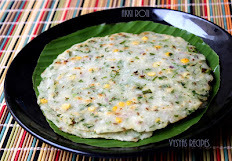 Do you have Rama navami recipes?